Nádrž paliva v leštěné nerezové oceli (boční vstup) náplň 40 L.
Polished Stainless Steel gas tank 40 litre (Ø 254 mm lenght 840 mm). 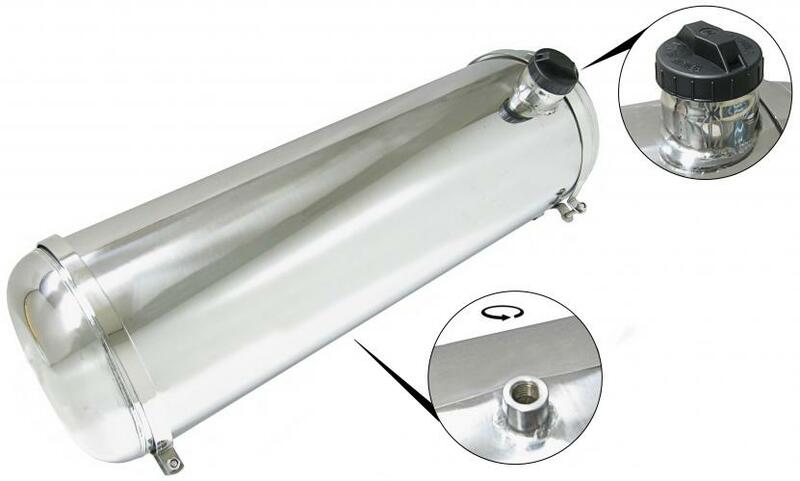 Polished stainless steel cylindrical tank, if you have a Beetle with a flip-front , you can show the location of the original fuel tank expire. In such a case, you should see the tank hitting just behind the dashboard wiring rid of. This tank can be mounted at a bus example above the engine (fuel through the tailgate) and Strollers behind the seats (above the engine). Naturally in many other places The tank is made ​​of polished stainless steel, rust or corrosion is excluded, you are hereby assured of a tank that you never have to replace and dazzling will shine, provided that you give him regular brushing at all times. The tank has a volume of approximately 40 liters with a length of 840 mm cmand a diameter of 255 mm and comes complete with stainless steel mounting brackets and fuel cap supplied. Do not forget to order # 1545.